YOUNGSTOWN, Ohio – Samantha Turner called for courage from her fellow young professionals in the quest to build a better community. Turner, the director of operations at Youngstown Area Goodwill Industries, was one of three MVP Award winners named from among the 25 Under 35 honorees recognized at last night’s ceremony at Stambaugh Auditorium. The event was presented by the Mahoning Valley Young Professionals in partnership with the Community Foundation of the Mahoning Valley. WFMJ-TV morning weather anchor Emily Frazzini hosted the event that raises money for the MVYP’s Young Philanthropist Fund. “It’s really important — as young professionals and elders and community leaders — that we begin to continuously and genuinely forge a better future for this community,” Turner said as she accepted her award. For young professionals, that means having the courage to ask questions, listen to the answers and invest in this community, said Turner, who lives in Youngstown. She said it’s important to “step from behind our screens and our convenient devices” and ask community leaders to show how to become involved in the community “in a meaningful way,” work to build “lasting, sustainable relationships across difficult lines,” and understand where the community has been and what it needs. The other two MVP winners were Dr. Jeff Johnson, an orthopedic surgeon and medical director of sports medicine with Mercy Health Youngstown, and Meghan Reed, director of the Trumbull County Historical Society. Following the presentation of each of the 25 Under 35 honorees, videos featuring remarks from coworkers and colleagues introduced each of the MVP winners. 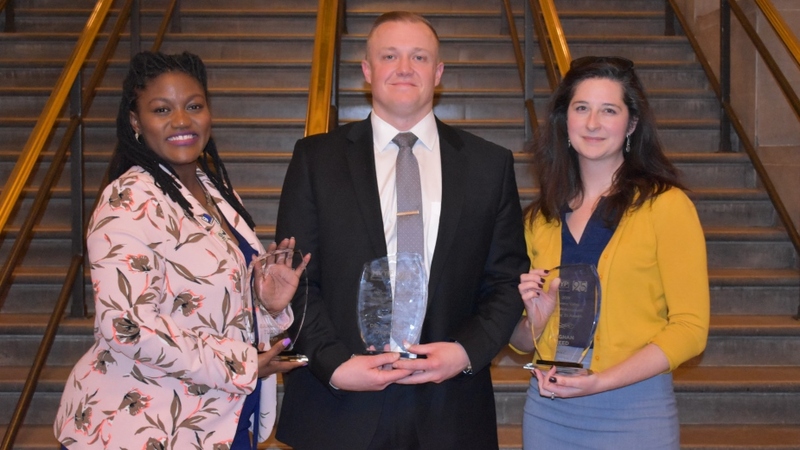 MVP award winners for the 2019 25 Under 35 Awards are (from left) Samantha Turner, Dr. Jeff Johnson and Meghan Reed. A sports injury in high school influenced his decision to enter medicine, he said. A Pittsburgh native, Reed was hired four years ago as the Trumbull County Historical Society’s first employee. Since then, she has expanded the society’s membership more than 500%, added programming and is preparing to work on transforming a building on Mahoning Avenue into a culture and education center. Despite growing up just an hour and a half away, she acknowledged she wasn’t very familiar with Ohio before coming here. Once moving to Warren, she “fell in love” with the town and the Valley, she recalled. “I’ve never felt the kind of community and support anywhere else as I have here,” she said. Nominees are judged on education, career achievement and service to community, and the top three scorers are named MVPs, said Cara Mia Gatti, who co-chaired the event with Rose Shaffer Saborse, MVYP president. This year, 86 young professionals were nominated, Saborse said. Shari Harrell, president of the Community Foundation of the Mahoning Valley and a member of the judging panel, said she is grateful to play “a small part in an event that highlights the tremendous talent we have right here in our Valley.” Choosing from those nominated “proves more difficult each and every year, but as in past years I’m inspired by who we chose,” she said. “Every year it’s a challenge,” Saborse agreed. Pictured: This year’s 25 Under 35 nominees.